July 3rd, 2014- The first half of 2014 has been characterized by a decrease of electricity consumption in Western Europe countries on a year-on-year basis. Such a decrease has been more relevant in countries like France or Great Britain, because winter of 2013 was especially cold in those latitudes, while in 2014 winter has been rather warm. In Mediterranean countries like Italy or Spain the decrease has been lower, because the average temperature increase has not been so important in the first half of the year. 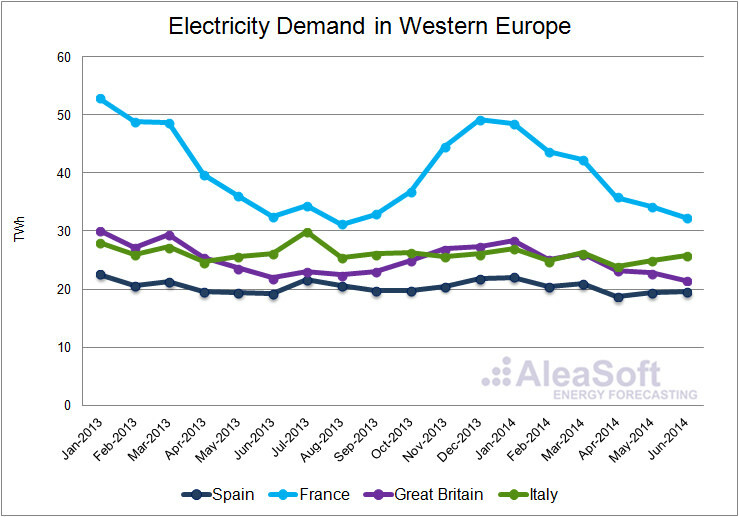 Evolution of the monthly electricity demand in Western Europe -2013 and the first half of 2014- (TWh). The electricity demand in Spain has lowered by 1.2% in these six months compared with the first half of 2013, mainly due to the higher temperatures registered this year. However, once corrected by the effect of working days and temperature, the electricity demand has growth by 0.1% according to REE (Red Eléctrica de España) data. This fact is due to the slight increase in the economic activity (for instance, during the first quarter a +0.5% year-on-year variation of the GDP was registered). In France, the electricity consumption has lowered by 8.5% in the first six months of 2014 compared to the same period of 2013. The main reason is that in the first half of 2013 temperatures were especially low, entailing a high electricity demand, and temperatures in 2014 have been higher compared to the average historical values. On the other side, the variation of the French GDP in the first three months of 2014 compared with the same period of 2013 has been positive (0.8%). Similarly, in Great Britain, the electricity demand in the first half of the year has fallen by 6.7% on a year-on-year basis. Also in this case, the main cause is the increase of the average temperature compared to 2013, whose first half was very cold. The GDP in United Kingdom grew by 3.2% during the first quarter of 2014 compared with the first quarter of the previous year. In Italy the electricity consumption has diminished by 3.0% in the first six months of 2014 compared with the same period of 2013. This decline is due to slightly higher temperatures in comparison with the first half of this year. Furthermore, in the first quarter the GDP fell by 0.5% compared with the first quarter of 2013. Regarding the second half of 2014, a growth of the economic activity is expected in the four analyzed countries. According to AleaSoft forecasts, this would entail a generalized increase of the electricity consumption compared to the same half of 2013, especially in Great Britain. These forecasts assume that temperatures will take historical average values. They also consider different growing scenarios for the GDP during the year 2014 compared with 2013. In Spain, an increase of the electricity demand is foreseen, according to a scenario of GDP growth of 1.0% in 2014. The forecasts indicate that the electricity demand in France will grow in the second half of 2014, considering a variation of the GDP of +0.9%. In Great Britain, an important increase of the electricity consumption is expected, assuming a GDP growth of 3.2%. 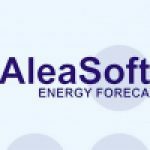 The electricity demand in Italy will be higher in the last six months of 2014 compared with the same period of the previous year according to AleaSoft forecasts. These forecasts assume that the GDP will grow by 0.5% in 2014.